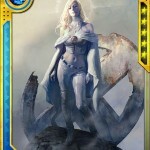 Emma Frost finally will be available as a playable character following the Human Torch's release. Check out our interview with a real life Emma Frost, the writer behind BBC's "The White Queen." Emma Frost has new cards in "Marvel War of Heroes," plus check out the "LEGO Marvel Superheros" trailer.